SayWhatNews – your online entertainment magazine is a free online publication dedicated to featuring up and coming artist and their work. The President and Founder Roynette Brown decided to publish her own online magazine after the Mortgage Company she worked for went out of business and she worked as a freelance reporter for an online newspaper just for a few months. SayWhatNews has featured some of the hottest up and coming artist and established artist just in the first few months of its launch online such as CeCe Peniston; Lisa Lavie; Ryan Huston; LaidEe P; Kelly Shephard (of Brian McKnight’s productions); Keni Myles; Amber Dirks; Candice Alley; Karina Pasian (Def Jams new artist); and Emily King (J Records new artist). 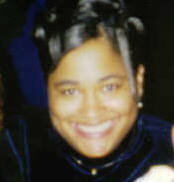 Roynette Brown a 33 year old former Manager of a Sub-prime Mortgage Dept. now stay at home mom with no formal training in web design has managed to construct a site that lands her company of the biggest and the best. “I was just looking around for something I could do from home” says Roynette. “My passion for the entertainment led me to create SayWhatNews. I started out learning how to build a site; getting web hosting and researching the industry”, said Roynette. And less than a year in business SayWhatNews gets over 100,000 hits a month. Now Roynette spends her day positioning her site to be in the top 5 in the entertainment webzine category as well as adding up-dates and new info to her site daily. Roynette say’s her goal is to broaden the minds of the urban listener to enjoy all types of music and art no matter what background. Her plans for the future are to be the biggest and the best; at the rate she is going, she will. 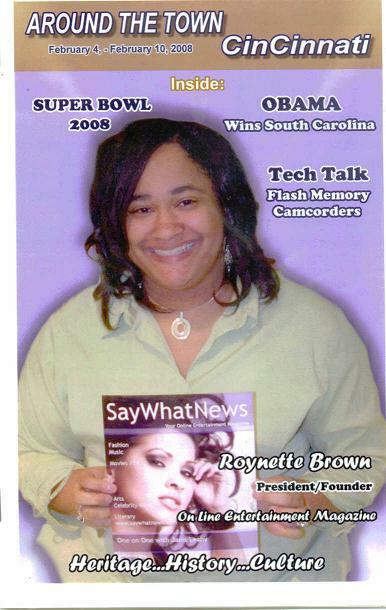 Cincinnati, Ohio, July 24, 2007 – SayWhatNews debuted it’s highly much anticipated urban online entertainment magazine (www.saywhatnews.com). SayWhatNews – your online entertainment magazine is a free online publication dedicated to featuring up and coming artist and their work. The President and founder Roynette Brown decided to publish her own online magazine with an urban touch after working as a Freelance reporter for an online newspaper. SayWhatNews has featured some of the hottest up and coming artist and established artists such as CeCe Peniston; Lisa Lavie; Ryan Huston; LaidEe P.; Kelly Shephard (of Brian McKnight’s Productions); Keni Myles; Janis Leahy; Amber Dirks; Candice Alley; Karina Pasian (new Def Jam Artist). The month of November gets even hotter with one on one interviews with J Records new sensation Emily King; CASH CAMP Entertainment and Essence Magazine’s Best Selling Author T.Styles. SayWhatNews – your online entertainment magazine with an urban touch that unlocks the door to the entertainment world. SayWhatNews provides daily the latest news in arts, music, movies, TV, fashion, literary and celebrity news. Monthly: SayWhatNews has one on one interviews with up and coming new artist and established artist. For more information please e-mail Roynette Brown at roynette.brown@saywhatnews.com or call (513)546-0990.